Definition: Area of the beam on a surface. 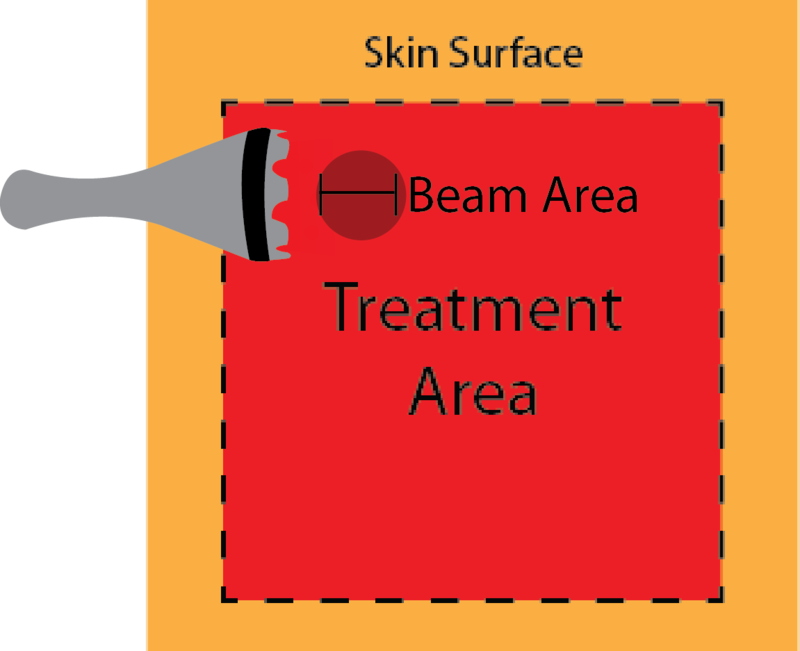 Beam area will depend on treatment head used and the distance the treatment head is held from the surface. 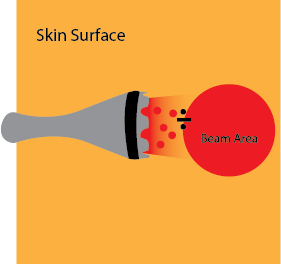 Instead of beam area, laser physicists use laser “spot size.” The spot size is either the beam radius or beam diameter, depending on the definition used. This is further complicated because the intensity of Gaussian laser beams decreases from a central maximum gradually to 0 at the edges. Since there is no clearly defined edge at which to measure the beam’s radius or diameter, “spot size” will depend on the spot size definition used (e.g., full width at half maximum or distance from maximum irradiance to irradiance of 1/e2). 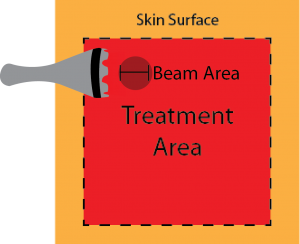 Nevertheless, by using a scanning application of PBM treatment, any inhomogeneities in the beam irradiance are averaged over the whole treatment area. 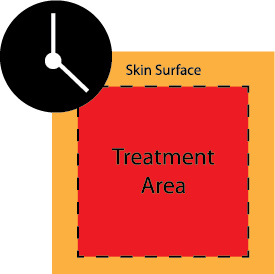 Definition: Area of the skin surface that is treated. 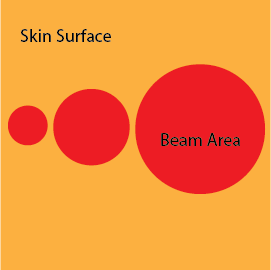 For LiteCure lasers, this area is larger than the beam area. Definition: Total time of a treatment to entire treatment area. 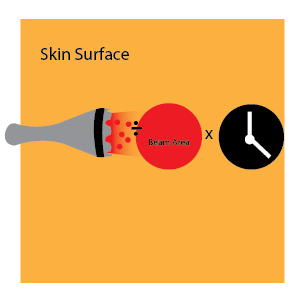 Definition: Time that surface is exposed to the beam. For scanning treatment with a LiteCure laser, the total treatment area is covered. 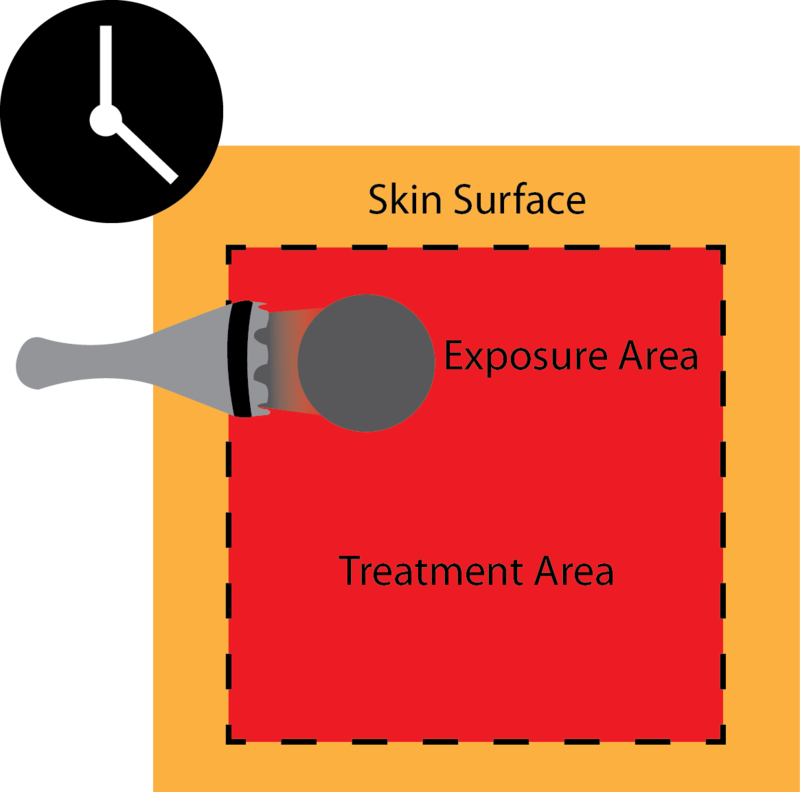 Assuming a uniform treatment to the skin, then the total exposure time of the skin to the beam during the treatment is related to the total treatment time by the ratio of the beam area to the treatment area. Hence, ts = t x (As/At). Definition: Radiant energy emitted per unit time. Definition: When referring to therapy lasers, most practitioners use the term frequency to mean the pulse frequency of the laser. Therapy lasers can operate in continuous or pulsed mode. 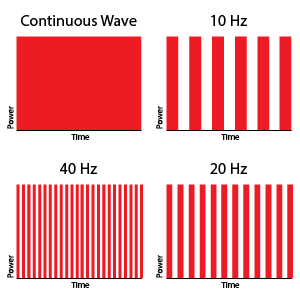 The pulse frequency is the number of times the laser is turned on and off during a second. 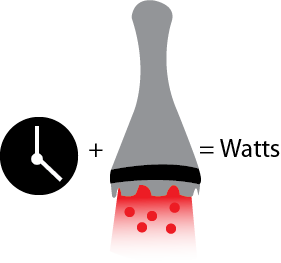 Definition: This term is used for pulsed lasers. 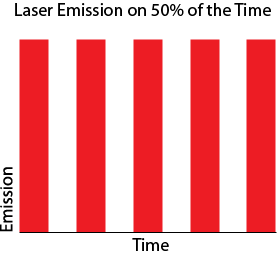 It is the percentage of one period in which the laser is emitting. For LiteCure lasers operating in pulsed mode, the duty cycle 50%. Definition: The total energy delivered during a treatment is determined by multiplying the average power during the treatment by the total treatment time. Definition: The output power of the laser divided by the beam area. The power intensity at the surface of the skin. First, let us assume that the treatment beam is uniform. With the exposure time ts = t x (As/At). This is the total energy delivered divided by the total treatment area. 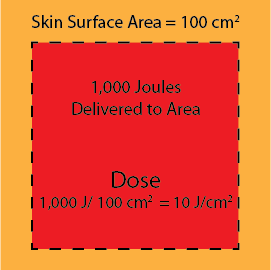 For LiteCure Lasers, the dose will be the total energy delivered to an area divided by the total area (skin surface area) to which it was delivered. This assumes that scanning covers the treatment area evenly to distribute an even dose to the tissue. By scanning the entire area evenly any inhomogeneities in the beam are averaged over the whole treatment area. Definition: The distance between two consecutive peaks of an electromagnetic wave. Definition: Molecule in the cell that transports chemical energy for metabolism. Definition: The part of the molecule that captures light energy. Definition: A laser which runs at constant output power. Definition: A component of the electron transport chain in mitochondria. Definition: The radiant energy released by certain electromagnetic processes. Electromagnetic radiation includes radio waves, microwaves, infrared radiation, visible light, ultraviolet radiation, X-rays, and gamma rays. See also electromagnetic spectrum. 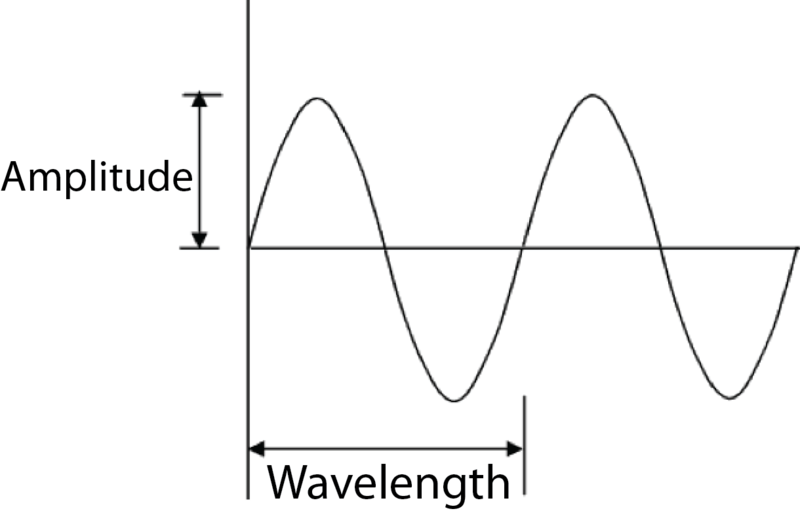 Definition: The range of wavelengths and frequencies of electromagnetic radiation (see figure below). Definition: Growing or originating from within an organism. Definition: An organelle found in large numbers in most cells, in which the biochemical processes of respiration and energy production occur. 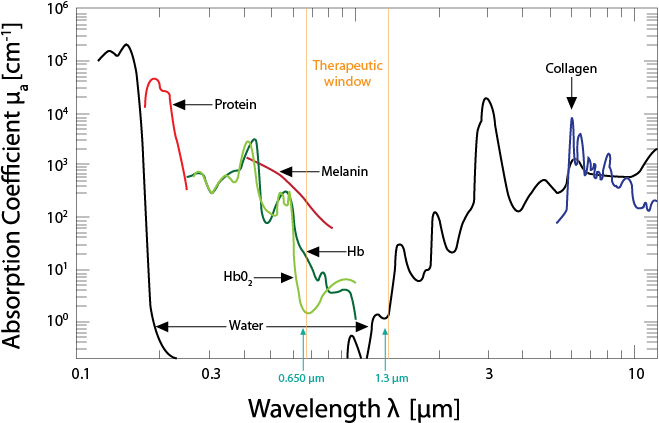 Definition: The range of wavelengths from 650 nm to 1350 nm where light has its maximum depth of penetration in biological tissue (see figure below). 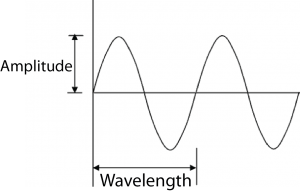 Visit the Wavelength Selection page for details about water absorption and to see the various absorption coefficients as a function of wavelength on a linear scale. Definition: Important cellular signaling molecule involved in many physiological and pathological processes. Definition: Predefined treatment sequence programmed into the laser software. Definition: Chemically reactive molecules containing oxygen. Definition: The widening of blood vessels, thus resulting in increased blood flow.